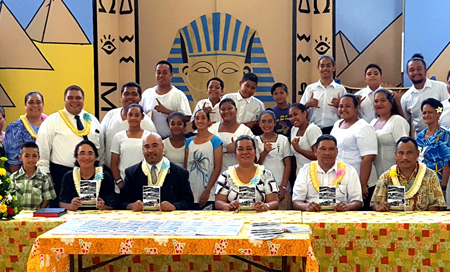 On Saturday, January 28th, staff members from the Samoan Studies Institute (SSI) at the American Samoa Community College (ASCC) joined members of the Fagatogo Congregational Christian Church of American Samoa (CCCAS) to launch a new publication that focuses on the oral history of Fagatogo Village. The book, titled “O Lo’u Nuu o Fagatogo” or “Fagatogo, My Village,” consists of 28 short essays written by the CCCAS Fagatogo Youth based on interviews with their elders concerning various aspects of the long and eventful history of Fagatogo. A collaborative effort between the ASCC-SSI and the CCCAS Fagatogo, the latter’s Youth were tasked with individually researching a particular story concerning the location’s long evolution from a traditional Samoan village, to the center of the Naval Administration from 1900 to the 1950s, to the present center of civic and commercial activity in American Samoa. To find out about people, places and events from long before they were born, the Youth members conducted interviews with their parents, family members and other adults, and then wrote their texts based on these accounts. Thus, those who know American Samoa’s distant past will find stories about familiar entities from our history such as the Fitafita Guard, Centipede Road, the Pago Bar, the Goat Island Club, Liki’s Store and much more. Fauolo-Manila credits former SSI faculty member Dr. David Addison, who applied for funding from the Amerika Samoa Humanities Council, for initiating the project. 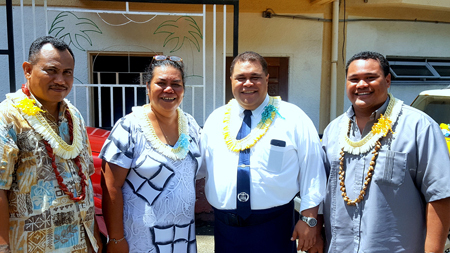 Another veteran of the SSI, Tofa Nunuimalo Apisaloma Toleafoa, helped forge the link between the Institute and the Fagatogo CCCAS. In her Acknowledgements, Fauolo-Manila also cites the contributions of Deanna Fuimaono for assisting the Youth with their writing and also helping to select photos. She also thanks Epi Suafo’a-Taua’i, the Humanities Scholar for the project, and former SSI staff member Sia Achica. Other SSI contributors included Evile Fatuauao Feleti, Ti’a Tasia Telemoni, Hannacho Sione, Tapua’isiva Tiamari Mulitalo-Cheung, Patrick Mafo’e, Muliagatele Elisaia Mailo, Vincent Tofilau and Maseuli Faleosalafai Tipa. Fauolo-Manila said the SSI plans to use “O Lo’u Nuu Fagatogo/Fagatogo, My Village” as a future resource for its literature courses. Anyone interested in obtaining a copy may contact the SSI through ASCC at 699-9155.